BSJ | Who was Josephine Butler? A social reformer? A pioneer? A forgotten saint? Who was Josephine Butler? A social reformer? A pioneer? A forgotten saint? As students, staff and friends of Josephine Butler College, I wonder how many times we have heard the words ‘our claim, is a claim for the rights of all’ at the end of every formal, and not fully considered the depth of meaning behind their use. When the opportunity to attend the lecture delivered by Dr. Helen Mathers arose at the beginning of the year, it appeared to be an invitation not to be missed. As members of the Butler community, it is important to consider the work, beliefs and values of the person our college is named after, and how we can continue her legacy. The focus of the lecture was to explore the life and work of Josephine Butler, within the historical context of her time. In the nineteenth century, the role of women can often be characterised by the ‘Angel in the House’ role which is sourced from Coventry Patmore’s poem published in 1854. This narrative confined women to the private sphere and enshrined their exclusive responsibility for domestic work within the family. Nevertheless, the reality for Josephine Butler was very different. Although Mathers suggested in her lecture that Josephine Butler was predisposed to be quite introverted, her legacy as a social reformer seems remarkably inconsistent with her personality. Dr. Mathers argued that an important part of Butler’s life was her almost evangelical Christianity. Although Butler throughout her life never imposed her beliefs on others, it would probably be a mistake to overlook the effects her beliefs had on forming her moralistic character. Throughout her life, whether it was her campaign to help the women of the Liverpool workhouses or her leadership of the North of England Council for the Higher Education of Women, Butler had a deep hatred for injustice and for her, injustice was not something that could just be ignored. Moreover, as a Politics student, an area of particular personal interest was her campaign to repeal the abhorrent Contagious Diseases Acts of 1864, 1866 and 1869. These acts were developed to help reduce the outbreak of sexually transmitted diseases in garrison and naval towns. However, in reality, they only served to victimise female prostitutes and inflict upon them heinous testing procedures. The work of Josephine Butler, campaigning through the writing of pamphlets, lobbying members of parliament and her mass petitioning, was ground-breaking work which undoubtedly influenced the methodology of the later suffrage movement. The decision to repeal the Contagious Diseases Acts in 1886 was a major turning point for the increasing influence of women within the public political sphere. The passion and expertise of Dr. Mathers was clear for everyone to witness and, in my opinion, with good reason. Josephine Butler was certainly a pioneer of social reform within the United Kingdom, with her ideas even extending across parts of Europe. Her work in enhancing opportunities for women to access higher education in the north of England, actually led to the creation of a number of institutions which form part of some of the UK’s most successful universities today. 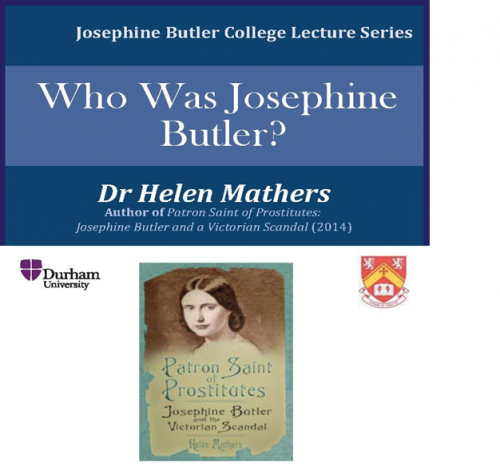 Consequently, it was discussed at the lecture whether it is a mistake to call Butler a ‘forgotten saint’ when there is a Josephine Butler Society and a college named in her honour. Even other contemporary leading suffragists held Butler up as an exemplar of what could be achieved, for example, Millicent Fawcett’s biography of her, first published in the 1920s, emphasised the importance of Butler’s work. In my view, Butler has not been forgotten, though her contribution to social reform within Britain has been disproportionately overlooked when compared to that of other contemporary actors. Finally, as friends, students and staff of Josephine Butler College, we have an obligation to recognise that the social injustices that Josephine Butler spent her life fighting have not been fully defeated. It was Dr. Mathers’ observation that the recent revelations of child abuse in Rotherham and across the country are prime examples of the evils that Butler despised. As a college, we pride ourselves on being known as the ‘local college’ that is not inward looking but outward facing. This is something that as a college we do well, with our JCR Charities Committee raising money for Grace House Children’s Hospice and our JCR Projects Committee getting involved directly in community projects. But this work is never complete. Josephine Butler spent her whole life identifying social injustice and tackling it head on, and if we promote an all-inclusive environment, both within and outside of college, then there is no reason why the legacy of Josephine Butler cannot be continued through our actions today.